For those of us who love the weather, what could be better than a restaurant dedicated or named after our favorite interest? Here in the Northwest a number of dining establishments are weather oriented and in this blog I will describe only a few. Well, I might as well start off with my favorite, a weather theme restaurant with a wonderful location for experiencing storms AND good food: Ivar's Mukilteo Landing restaurant--in Mukilteo right next to the ferry dock. This restaurant has a real weather story...the original facility was destroyed by surge of strong westerly winds that moved from the Pacific down the Strait of Juan de Fuca on October 28, 2003. Ivar's management decided to rebuild it and to do so with a decided weather theme. You enter the restaurant and on the right there is a huge mural illustrating the giant waves that pummeled the restaurant that day. On the left, a wall of newspaper articles describing the storm and the destruction. This entry way is enough to get even the most tepid meteorologist salivating. A little further you will find a panel of working weather instruments. There is a note that if the winds exceed a certain speed that you should push the red warning button and go back to your table and order dessert. My kind of place. And there are big windows facing the water to the west and northwest, also giving a good view of the arriving and departing ferries. On a stormy day you would have quite a show. And here is the surprising thing--with all the meteorological fun this restaurant has really good food. So Ivar's Mukilteo Landing is clearly my top choice. (2) For all its strengths, Mukilteo Landing has one weakness--the name says nothing about weather. No worry. You can eat at Forecasters Public House in Woodinville. Located in the Redhook Brewery Complex next to St. Michelle Winery, you will find a sign showing an old New England meteorologist in serious rain gear. For good or for bad, this place hasn't been destroyed by weather yet, although its proximity to the Samammish slough leaves open the potential for flooding. There are weather instruments inside the door and lots of the wet stuff (Redbook beer). I asked the individual at the gift shop whether they were interested in carrying my book...and she laughed (not a good sign). The food is typical brew food: ok, but not great, but there is a nice deck for eating and drinking in warm weather. And you can always sign up for the brewery tour. 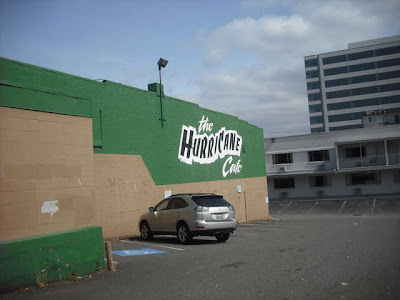 (3) If you are looking for a a more tropical weather experience, you could go to the Hurricane Cafe in downtown Seattle. For breakfast they offer dishes like the "Typhoon" and "The Storm" and for lunch and dinner there is the "Hurricane Burger" and the "Hurricane Sampler." I haven't eaten there but let me quote from an online review: "As dives go, my dining experience was surprisingly awesome." 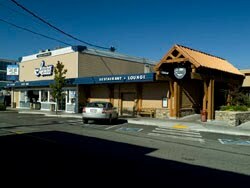 (There used to be a Convergence Zone tavern near Paine Field, but that is closed now). Of course, there are plenty of good restaurants for watching the weather in the Northwest...but that is another blog. If blog reader know of other weather eateries...let us know in the comments below.